Originally from India, this chameleon of a cucumber dramatically changes color as it ripens on the vine, going from creamy white to yellow to a pumpkin-y russet. At each stage, it’s sweet and juicy and about as crunchy as a Honeycrisp apple. Look for it now at Keith’s Farm stand at the Union Square Greenmarket, and use it any way you would a good slicing cuke. For a one-stop-shopping Poona kheera sandwich, grab a tublet of butter at Ronnybrook, a hunk of cheese at Cato Corner, then some Finnish rye at the Nordic Breads stand, whose delicious, crowd-pleasing samples we took as inspiration for the following recipe. (1) Thinly slice the cucumber. Season with salt and pepper. (Alternatively, peel the cucumber, slice thinly, quickly pickle for ten minutes in a shallow bowl with 1/4 teaspoon of salt and the juice from half a lemon, then drain in a colander.) Split the bread in half, and butter each of the insides. 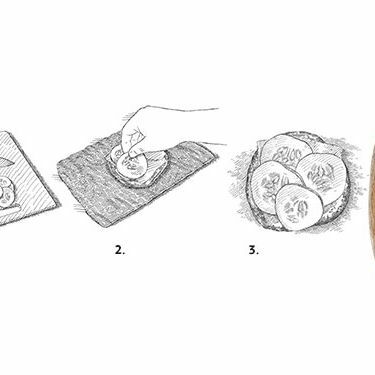 Shave the cheese into medium-thin slices, and distribute equally on each of the four halves of bread. (2) Top with cucumber slices. (3) Serve open-faced. This story appeared in the July, 30, 2012 issue of New York Magazine.